Indie Retro News: Apocryph - Brutal FPS which looks a bit like Painkiller goes early access! Apocryph - Brutal FPS which looks a bit like Painkiller goes early access! Something for everyone this week as now we look towards a bloody and brutal first person shooter called ' Apocryph ', developed by Bigzur using Unity. 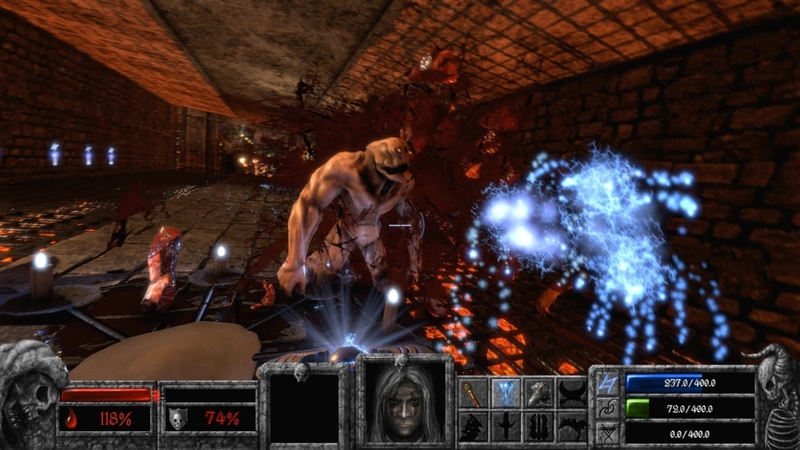 If you remember games such as Hexen, Heretic or Painkiller, then you'll know what to expect with this game, as not only is it set in a dark fantasy world of violence, magic, dark rituals and dangers, but you'll be facing horrific monsters, nasty traps, secret passages and the will to survive with a mighty weapon at your disposal! To be honest when I first saw this game it reminded me more of Painkiller compared to the others, as the enemies come at you thick and fast and the weapon used against them is usually of the body ripping apart variety spinning at about 2000rpm! Furthermore the game levels in Apocryph are diverse, with lots of secrets, monsters and traps, and you can also find even more deadly weapons including melee armaments, spells, staffs and artefacts, with rare relics to be found which may even turn you into an avatar of Death itself!